Growing up by the seaside I have fond memories of hanging around in dinghy arcades. Three cheers for garish flashing lights! Three cheers for 8-bit GAME OVER jingles that haunt you in your dreams! I seldom used to get very far in the games: zombies with missing limbs would swarm and slash me to pieces on House of the Dead, an ill-informed proclivity for avoiding the brake pedal would limit my progress on Sega Rally and a reckless greed to gobble up all of the ghosts ensured that I didn’t ever get past level two on Pac-Man. But despite my failings I always used to have a wicked time trying to shoot one more zombie, reach one more rally stage or consume one more of those pesky ghosts. There is something incredibly fun about torturing yourself with the expectation of impossible success. The Four Quarters Bar in Peckham builds on this masochistic thirst for failure by adding booze into the equation. This way, as the night goes on, you have an excuse for not getting any better at the games. The bar is reasonably priced and adroitly stocked with a wide selection of draught and bottled craft beers. 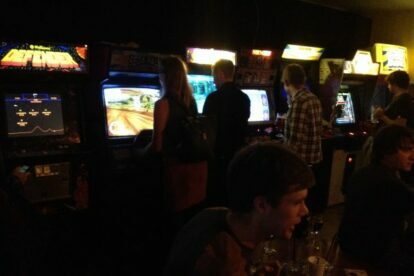 And with over a dozen lovingly restored arcade games to fail at, you’ll have plenty of reason to try all of the beers.